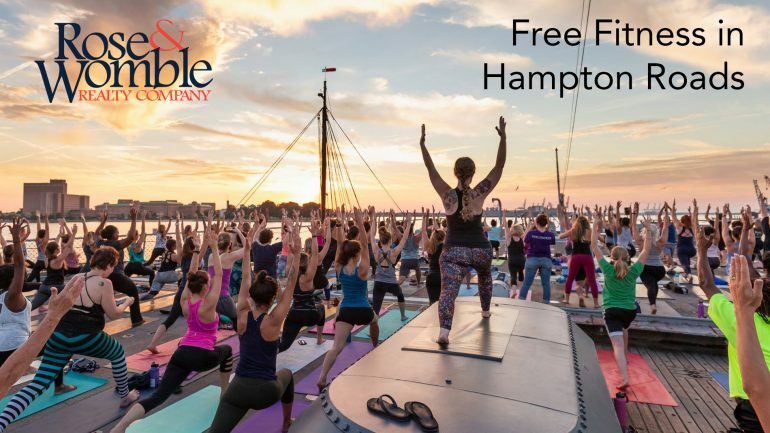 Free fitness in Hampton Roads - Rose & Womble Realty Co.
As the new year begins we are called to reflect on the past, to take inventory of our achievements and cultivate gratitude for all that we have. We look ahead to the future and set our intentions to create healthier, more fulfilling habits, routines and goals. For many of us, establishing a more consistent or varied fitness regimen. But what if your physical health isn’t the only “figure” you’re watching? If you’re like me, you may have also set some financial goals for the new year. Lucky for us, Hampton Roads has a lot of great free fitness. Not to say you need to go cancel your gym membership, but these events can be a great compliment to your current exercise routine. Or, if you’re new to fitness these resources are a great way to get started with no financial buy-in! Do you love being in nature and exercising? You’ll fit right in with the East Coast Hikers, a local meetup group that gathers to hike the area’s best trails. Hikes are scheduled pretty frequently, sometimes multiple times a week, making it easier to join a hike that works with your schedule. No experience or cash needed, check out their upcoming hikes here. Since its inception in 2016, North End Run Club has seen some serious growth! This free run club was established by local DJ Barry Clark in an effort to connect with his local community in a different way outside of the nightlife scene. The group—now with over 200 runners—meets every Tuesday at 6:15 p.m. at the North End of Virginia Beach Oceanfront. Follow the North End Run Club on Facebook or Instagram to stay current on meetup times and running route/distance options. New to running? No experience needed, just you! Are you looking to get started with fitness, but aren’t sure how to start or are looking for a gym buddy? This meetup is for you! This group meets for free fitness discussions, book clubs and scheduled outings. Note; a handful of events may be held at local fitness centers and therefore are not free. Check out their upcoming schedule here. Have you ever wondered how to do a handstand, or are curious to try? Join the 757 Flight Club for Handstands with Friends. This is a fun and friendly meetup of local hand balancers who are working on exploring the world from a different perspective; upside down! No experience needed, all levels and brand new beginners welcome. Note, this group typically meets in the warmer months as the meetup is held outdoors. Stay tuned for their next scheduled meetup here. Start the new year feeling balanced and refreshed by attending one of Bhav Brigade’s pop up, donation-based yoga classes throughout Hampton Roads. What does donation based mean? The class is free, but students are welcome (not required) to donate any amount they feel the class was worth. A portion of all proceeds go to a local charity. Check out their upcoming classes here. This Newport News run group was started in an effort to provide a fun, stress-free fitness option for those seeking something different than the typical gym routine. This group meets either for morning runs or evening runs, followed by an optional beer together at a local restaurant or bar. Check out their upcoming events here. This free outdoor fitness park has become a popular place for fitness enthusiasts, beginners and passersby along the Virginia Beach Oceanfront boardwalk. Complete with high bars, low bars, parallel bars, fitness climber/ropes, level ring climber, slackline posts, swing-a-long rings, rope climber, low parallel bars, balance beam and more! A great free resource to challenge your fitness. No matter if you plan to hit the streets, trails, yoga mat, elliptical or bike, make sure to approach your new year fitness plan with an open mind and remember to have fun! Do you have any other recommendations for free fitness in Hampton Roads? Share them via the comments below.